Gliese 163 is a nearby red dwarf star 50 light years away in the Dorado constellation. Another larger planet, Gliese 163b, was also found to orbit the star much closer with a nine days period. An additional third, but unconfirmed planet, might be orbiting the star much farther away. Gliese 163c could have a size between 1.8 to 2.4 Earth radii, depending if it is composed mostly of rock or water, respectively. It receives on average 40% more light from its parent star than Earth from the Sun, making it hotter. In comparison, Venus receives 90% more light from the Sun than Earth. We do not know the properties of the atmosphere of Gliese 163c but, if we assume that it is a scaled up version of Earth's atmosphere, then its surface temperature might be around 60°C. Most complex life on Earth (plants, animals, and even humans) are not able to survive at temperatures above 50°C, however, plenty of extremophilic microbial life forms can thrive at those temperatures or higher. The detection of potential habitable exoplanets is pacing up. There are now six including the debated Gliese 581g, most of them detected just in the last year. Four of these bodies, Gliese 581d, Gliese 667Cc, Gliese 581g, and now Gliese 163c are around red dwarfs stars (M-star). HD 85512 is around a K-star (a middle star between the smaller red dwarfs and the Sun). Only Kepler-22b is around a Sun-like star (G-star). All of these planets are bigger than Earth but still considered potentially habitable, at least to simple life forms. Scientists are trying to construct better ground and space observatories in the next decades to be able to detect smaller worlds, those more resembling Earth. The Habitable Exoplanet Catalog of the Planetary Habitability Laboratory @ UPR Arecibo (phl.upr.edu), which was not involved in the discovery, now includes and ranks Gliese 163c as number five in its main list of best objects of interest for life. Enlarge Current six potential habitable exoplanets ranked by similarity with Earth (Earth = 1.00). Four of these objects have been detected in the last year, from September 2011 to today. 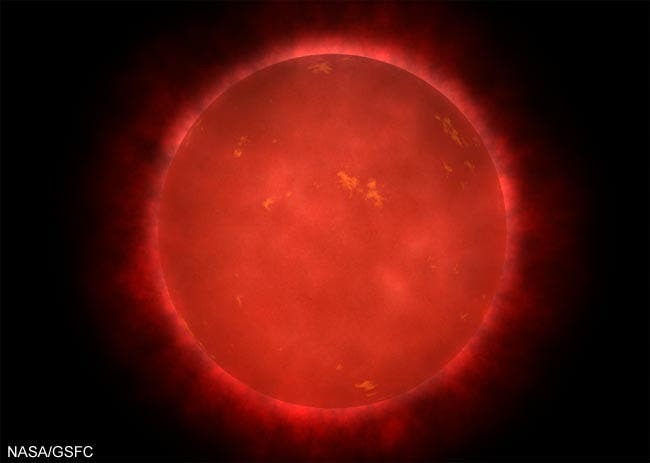 The potential for habitable planets around red dwarf stars has been and issue of much debate. Tidal effects on the planets around these stars might cause extra surface heating or even tidal locking (always giving the same face to its parent star). Also, these stars are more active and their stellar wind might erode planetary atmospheres much faster. These factors might preclude the potential for life on smaller planets but not for planets with thicker atmospheres, something expected for superterran planets. Our Solar System lacks an example of a superterran. Its eight planets are either the smaller terrestrial kind, like Earth, or the larger gas giants, like Jupiter. Understanding superterrans around red dwarf stars, a non Sun-like star, just adds to the challenge of assessing their habitability. The NASA Kepler Mission has detected about 27 potential habitable exoplanets candidates out of their over 2,300 exoplanets that are waiting to be confirmed. Some of these bodies seem very Earth-like. Unfortunately, they are much farther away from us than Gliese 163 and it will be nearly impossible to determine if they are really habitable worlds by future observations. However, the statistical analysis of Kepler suggests that these planets are very common in the galaxy. Therefore, many more Earth-like worlds are waiting to be discovered in our solar neighborhood too, such as Gliese 163c. The new exoplanets around Gliese 163 were discovered by the European HARPS team leaded by Xavier Bonfils from the UJF-Grenoble/CNRS-INSU, Institut de Plane ́tologie et d'Astrophysique of Grenoble, France. Other participating scientists are from France, Germany, Portugal, Switzerland, and Belgium. Gliese 163c was announced by team member Thierry Forveille from the Observatoire de Grenoble during the International Astronomical Union session Formation, Detection, and Characterization of Extrasolar Habitable Planets from August 27th to 31st, 2012 in Beijing, China.